I came here to study financial management, however after my first year of foundation studies, I was given the choice to study a joint degree. This inspired me as I thought a joint degree would open up more opportunities. It also enabled me to combine politics and international relations with economics, skills that I want to use when I finish and pursue my career in Papua New Guinea (PNG). My reason for choosing JCU is because it was closer to home. I have three children and to take them further south would mean that it would be very expensive for us to travel home. The climate here is also very similar to home life. The lecturers are so helpful. I love them. I am able to go to them for help whenever I need it and I have a great working relationship with them. One of my lecturers also has children and I feel that she understands some of the struggles I have when I am studying. At first, the transition from work life, to study was difficult for me. I hadn’t studied since I left school in Year 10 and completed my Diploma of Accounting. It was hard at first, as I didn’t know how things were done at this level, and especially because I initially needed to leave my children at home. 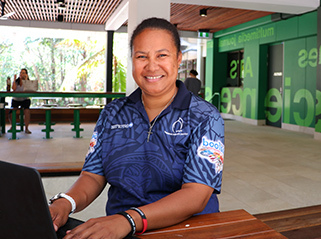 I was actually going to stop studying and go back home, but the support provided by the International Support Officers at JCU helped me a lot. They directed me to all the help I would need, they told me about the counselling, the library services, they gave us a one month introductory program before starting our courses — they were my one stop shop. It was great, and the fact that help was available was one of the reasons that I kept on going. I love learning about economics — because it’s in everyday life. I was a member of the Business Professional Women’s group in PNG and we worked on a number of projects to build economic empowerment in women. We provided scholarships to girls who cannot afford to pay for their education. It’s something I will definitely continue when I return, I want to be a strong advocate for gender equality in PNG. I believe my qualifications, both in economics and in politics and international relations, will allow me to work in governance and positively impact others in PNG.